WASHINGTON — U.S. drone strikes are up and at it again in Yemen, continuing to target al-Qaeda-linked terrorists operating in the region. Reuters reports  that al-Qaeda militants continue to operate in the southern areas. Two al-Qaeda militants were killed Monday in a drone strike by the U.S. government south of the capital city Sana’a. This past Saturday, up to four militants were killed in a different part of southern Yemen. 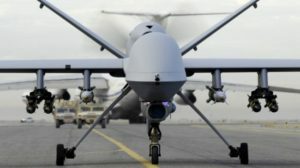 The U.S. government does not discuss their drone strikes and this policy is under fire in the U.S., but not by the liberal media which stays silent . The Yemeni branch of al-Qaeda, called al-Qaeda in the Arabian Peninsula (AQAP) and is considered the most dangerous branch of the international Islamist terrorist group. The group, according to Reuters, has exploited Arab Spring to take parts of Yemen in 2011 and put it under their control. Yemen’s geopolitical position along major oil shipping routes  make it an important part of most industrialized economies and their foreign policy.